Watch our video to learn how to make Easy Chicken and Broccoli & you'll always have a go-to recipe. 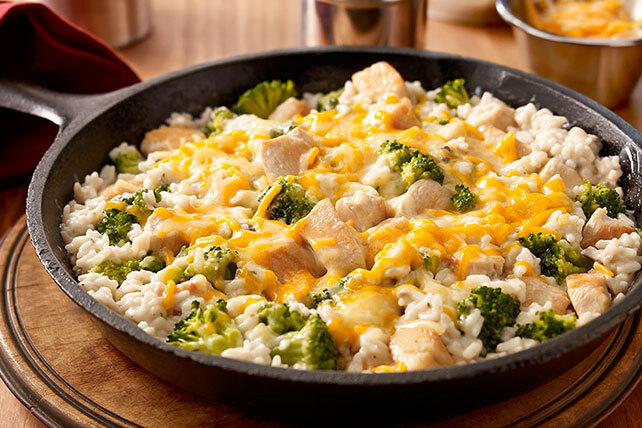 Easy Chicken and Broccoli is great for any night. Cook and stir chicken in large skillet sprayed with cooking spray on medium-high heat 2 to 3 min. or until evenly browned. Add broccoli, soup and water; stir. Bring to boil. Stir in rice; sprinkle with cheese. Cover; simmer on low heat 5 min. Prepare using your family's favorite frozen vegetable. Prepare using 2 cups cooked long-grain white rice.